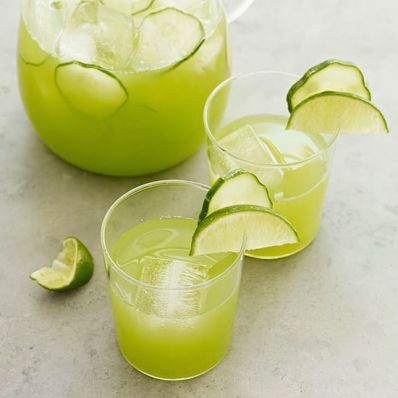 1 of 1 In a blender, combine cucumbers, lime juice, sugar, salt and 4 cups cold water. Blend until smooth. Pour mixture into a mesh strainer placed over a pitcher, pressing pulp to release as much liquid as possible. Discard pulp. Add enough ice to fill pitcher. Garnish agua fresca and glasses with cucumber slices and lime wedges. Per Serving: 37 mg sodium, 0 g fiber, 5 g carb., 0 g sat. fat, 0 g Fat, total, 0 mg chol., 16 kcal cal.